In law, treason is the crime of disloyalty to one's nation. A person who betrays the nation of their citizenship and/or reneges on an oath of loyalty and in some way willfully cooperates with an enemy, is considered to be a traitor. Traitorous acts include helping a foreign government to overthrow or make war against one's own state, conspiring by oneself to overthrow the government, and killing a head of state. The similar offense of sedition need not involve acts against the government, but rather is the act of inciting insurrection or rebellion. The punishment for treason varies by nation, though is typically harsh so as to discourage the action. Historically, treason was considered the worst crime and drew the harshest penalties. In England, punishment for treason went beyond the standard execution by hanging, invoking the horrific drawing and quartering. However, the charge of treason was greatly abused by monarchs, who used it to remove their opponents. Thus, the United States Constitution restricts the definition of treason, and denies Congress the authority to reshape the offense. Today, acts of treason in the traditional sense are less common, given the changes in political structure and increasing globalization. Many of those conspiring and acting against authority, particularly terrorists, do not necessarily act against a particular government, but rather against an ideology or for a cause that goes beyond statehood. Thus, some governments have declared an act of treason to include support for organizations deemed a threat, such as al-Qaeda. Treason has always been viewed as the most serious offense, for it is an act against not only an individual but against the society as a whole, embodied in the ruling authority whether individually in the monarch or collectively as government. It is indeed the act or attempt to "murder" one's nation. While harsh penalties have been used in attempts to deter traitors, the very reason that such acts are considered the worst of crimes are the same ones that drive people to commit them. While people are dissatisfied with human society and find no comfort or recognition from its leaders, they will be tempted, even forced to rebel against those that lead their own "home," violating the relationship of trust that should exist. The only way that treason and sedition can be eliminated is by the emergence of true authority, able to care for all the people with a parental heart that embraces and allows each to fulfill their own potential as individuals, feeling value and valued through their relationships and contributions to society. Treason is defined as a betrayal of one's homeland. Some crimes that can be considered treason include murdering the sovereign or head of state, making war against the state, conspiring with an enemy of the state, or revealing state secrets. Today, murder is generally considered the worst of crimes, but in the past, treason was thought of as worse. In Dante Alighieri's Inferno, the lowest circles of Hell are reserved for traitors; Judas Iscariot, who betrayed Jesus in Christian theology, suffers the worst torments of all. His treachery is in fact so notorious that his name has long been synonymous with "traitor," a fate he shares with Benedict Arnold, Pétain, Quisling, Alcibiades, and Ephialtes. In English law, high treason was punishable by the horrific method of execution known as hanging, drawing and quartering, the only crime which attracted that penalty. In Shakespeare's play King Lear (c. 1600), when the king learns that his daughter Regan has publicly dishonored him, he says "They could not, would not do 't; 'tis worse than murder," a conventional attitude at that time. Today, the punishment for treason varies by jurisdiction, although it is usually a lengthy prison sentence. At times, the term "traitor" has been leveled as a political epithet, regardless of any verifiable treasonous action. In a civil war or insurrection, the winners may deem the losers to be traitors. Likewise the term "traitor" is used in heated political discussion—typically as a slur against political dissidents, or against officials in power who are perceived as failing to act in the best interest of their constituents. In certain cases, as with the German Dolchstoßlegende, the accusation of treason towards a large group of people can be a unifying political message. Sedition is a term of law to refer to covert conduct such as speech and organization that is deemed by the legal authority as tending toward insurrection against the established order. Sedition often included subversion of a constitution and incitement of discontent (or resistance) to lawful authority. Sedition may include any commotion, though not aimed at direct and open violence against the laws. Seditious words in writing are seditious libel. Because sedition is typically considered a subversive act, the overt acts that may be prosecutable under sedition laws vary from one legal code to another. The difference between sedition and treason consists primarily in the subjective ultimate object of the violation to the public peace. Sedition does not consist of levying war against a government or of adhering to its enemies, giving enemy’s aid, and giving enemies comfort. Nor does it consist, in most representative democracies, of peaceful protest against a government, nor of attempting to change the government by democratic means (such as direct democracy or constitutional convention). Put simply, sedition is the stirring up of rebellion against the government in power. Treason is the violation of allegiance to one's sovereign or state and has to do with giving aid to enemies or levying war. Sedition involves encouraging people to rebel, while treason is actually betraying the country. The English Treason Act 1695 enacted, among other things, a rule that treason could be proved only in a trial by the evidence of two witnesses to the same overt act. Nearly one hundred years later this rule was incorporated into the United States Constitution. It also provided for a three-year time limit on bringing prosecutions for treason (except for assassinating the king), another rule which has been imitated in some common law countries. The Treason Act 1795 made it treason to imprison, restrain, or wound the king. Although this law was repealed in the United Kingdom in 1998 it still continues to apply in some Commonwealth countries. To avoid the abuses of the English law (including executions by Henry VIII of those who criticized his repeated marriages), treason was specifically defined in the United States Constitution, the only crime so defined. Article Three defines treason as levying war against the United States or "in adhering to their Enemies, giving them Aid and Comfort," and requires the testimony of two witnesses to the same overt act or a confession in open court for conviction. Congress has, at times, passed statutes creating treason-like offenses with different names (such as sedition in the 1798 Alien and Sedition Acts, or espionage and sabotage in the 1917 Espionage Act) that do not require the testimony of two witnesses and have a much broader definition than Article Three treason. For example, some well-known spies have been convicted of espionage rather than treason. In the history of the United States there have been fewer than 40 federal prosecutions for treason and even fewer convictions. Several men were convicted of treason in connection with the 1794 Whiskey Rebellion but were pardoned by President George Washington. The most famous treason trial, that of Aaron Burr in 1807, resulted in acquittal. Politically motivated attempts to convict opponents of the Jeffersonian Embargo Acts and the Fugitive Slave Law of 1850 all failed. Most states have provisions in their constitutions or statutes similar to those in the U.S. Constitution. There have been only two successful prosecutions for treason on the state level, that of Thomas Dorr in Rhode Island and that of John Brown in Virginia. After the American Civil War, no person involved with the Confederate States of America was tried for treason, though a number of leading Confederates (including Jefferson Davis and Robert E. Lee) were indicted. Those who had been indicted received a blanket amnesty issued by President Andrew Johnson when he left office in 1869. The Cold War saw frequent associations between treason and support for (or insufficient hostility toward) Communist-backed causes. The most memorable of these came from Senator Joseph McCarthy, who characterized the Franklin Delano Roosevelt and Harry Truman administrations as "twenty years of treason." McCarthy also investigated various government agencies for Soviet spy rings; however, he acted as a political fact-finder rather than criminal prosecutor. Despite such rhetoric, the Cold War period saw few prosecutions for treason. Financial gain has been an incentive for treason. In the 1990s, CIA officers Aldrich Ames and Harold James Nicholson were caught passing information to Russian intelligence services in return for payment. The global "War on Terror" following the terrorist attacks of September 11, 2001 has created a gray area for the definition of treason. As the war is not being fought against a nation but against an ideology, combatants and allies can be of any nation. The British government declared that any citizen found fighting for the Taliban would be prosecuted for treason if caught. In August 2005, it was reported that the UK Government was considering bringing prosecutions for treason against a number of British Islamic clerics who had publicly spoken positively about acts of terrorism against civilians in Britain, or attacks on British soldiers abroad, including the July 7 London bombings and numerous attacks on troops serving in Iraq and Afghanistan. However, later that year prosecutors indicted Abu Hamza al-Masri for inciting murder, not treason. On October 11, 2006, a federal grand jury issued the first indictment for treason against the United States since 1952, charging Adam Yahiye Gadahn for videos in which he spoke supportively of al-Qaeda. 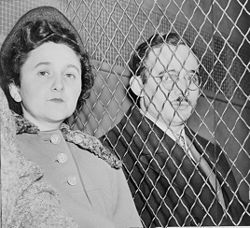 Several people generally thought of as traitors in the United States, including Jonathan Pollard, the Walker Family, Robert Soblen, and Julius and Ethel Rosenberg, were not prosecuted for treason, but rather for espionage. John Walker Lindh, an American citizen who fought with the Taliban against the U.S.-supported Northern Alliance, was convicted of conspiracy to murder U.S. nationals rather than treason. ↑ FBI History, Federal Bureau of Investigation. Retrieved August 27, 2007. ↑ Joint CIA-FBI Press Release on Arrest of Harold James Nicholson, Federation of American Scientists. Retrieved August 27, 2007. ↑ “Terror treason charge considered,” BBC News. Retrieved August 27, 2007. Weyl, Nathaniel. Treason: The Story of Disloyalty and Betrayal in American History. Public Affairs Press, 1950. This page was last modified on 2 April 2008, at 18:01.